On Thursday, the Dow Jones Industrial Average plummeted 358 points. It was the largest single day decline in a year and a half, and investors are starting to panic. Overall, the Dow is now down more than 1300 points from the peak of the market. Just yesterday, I wrote about all of the experts that are warning about a stock market crash in 2015, and after today I am sure that a lot more people will start jumping on the bandwagon. In particular, tech stocks are getting absolutely hammered lately. The Nasdaq has fallen close to 3.5% over the past two days alone, and it has dropped below its 200-day moving average. The Russell 2000 (a small-cap stock market index) is also now trading below its 200-day moving average. 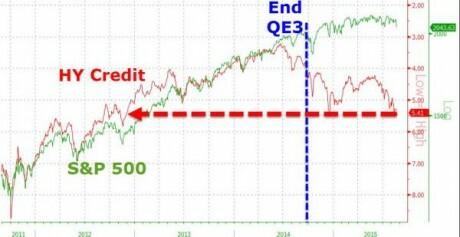 What all of this means is that the stock market crash of 2015 has already begun. The only question left to answer at this point is how bad it will ultimately turn out to be.